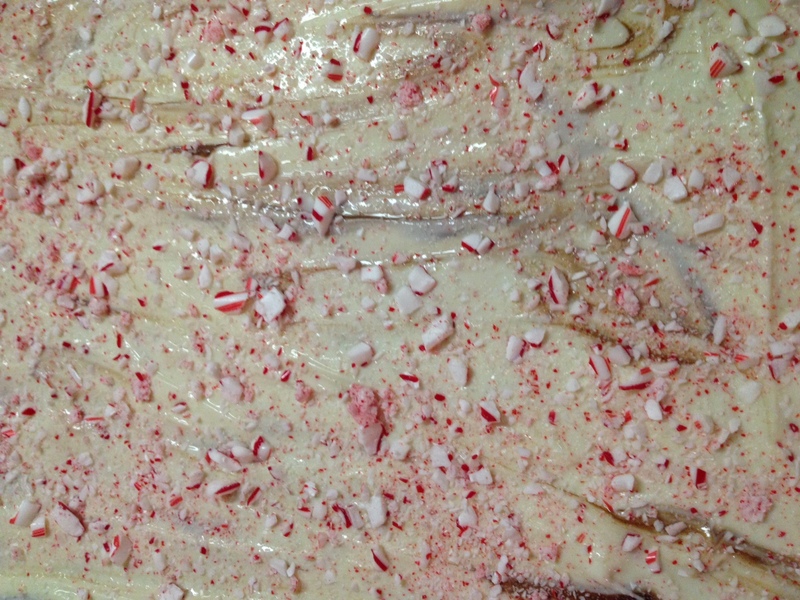 Ok, I haven’t tried all the peppermint bark recipes in the world, but I can’t imagine one being easier than this. I have been asked for the recipe so many times and every time I respond with, “well, it’s not even really a recipe.” We have a tradition of making sweet treats for my in-laws every year for Christmas. This tradition started years ago before they were my in-laws and long before I knew how to cook or bake anything. So, the treats all relied on melting chocolate and dipping things in it or making things out of it. This peppermint bark is a great crowd pleaser if you need stocking stuffers, gifts for neighbors, or you’re throwing or going to a holiday party this year. First, line a cookie sheet with parchment paper. Then, put 5 candy canes into a plastic bag and bash them with a rolling pin until broken into small pieces. This is a great way to work out some of the tension that always pops up during the holidays. Then, melt the semisweet chocolate chips in a double boiler being very careful not to get any water into the chocolate. You can make your own double boiler by boiling about an inch of water in a sauce pan and placing a glass or metal boil over it so the steam from the water heats the bowl. Low heat tends to be best and it’s important not to walk away for too long since chocolate can burn quickly. You can also melt the chocolate in the microwave, stirring every 30 seconds until completely melted. Once melted, just pour the chocolate into the cookie sheet and smooth it out. Let that sit until mostly hardened (about 45 minutes but this can be sped up by popping it in the fridge). Then, just repeat the melting process with white chocolate and stir in about ¼ cup of your peppermint once melted. Pour that over the semisweet chocolate and gently smooth and swirl it on top. Lastly, just top with the rest of your peppermint and let harden completely. 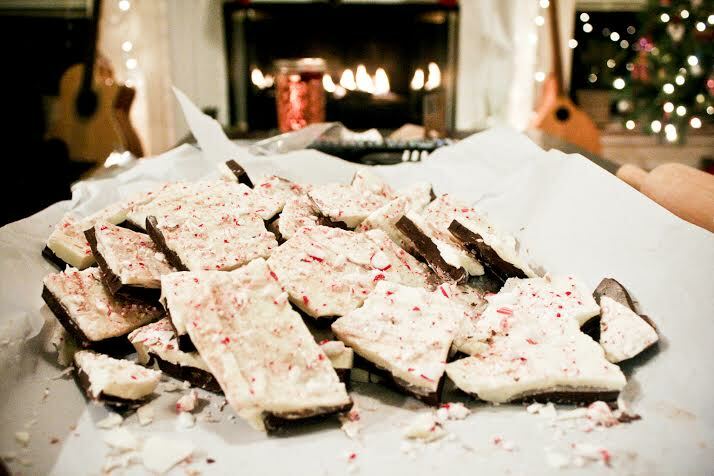 Once hardened, break up your peppermint bark into any size pieces you like and enjoy! This is another easy recipe to dress up or down depending on how difficult or fancy you want to make it. It’s fairly simple to pour the layers of chocolate into candy molds or cookie cutters if you want to make some impressive shapes. You can also throw additional toppings on with the peppermint. We like using crystal sugar sprinkles to make it a little sparkly and little snow flake sprinkles are always a fun touch for holiday treats! I’ll definitely have to give this recipe a try! ← Holiday Party or Game Night Idea: Popcorn Bar!